Life is a funny money riddle. Many Gilroy residents try to solve this riddle to ensure they don’t outlive their retirement savings. Many public servants chose their profession based on the pension promise to eliminate financial burdens later in life. Higher wages were sacrificed for the promise of guaranteed income creating a worry-free retirement that is appealing to many. Over the years, pensions have provided trillions of dollars to Americans who’ve paid dues in government and public service. Now, many states are discovering certain issues with pensions have been ignored and some deficits leave pensions unsustainable in the long term. This means one of two things for retirees. Employees will not receive the money they have been promised and may have to return to the work force as a result. 2.The federal government will bail out pension funds. Neither option seems favorable to taxpayers as we seem destined for tax increases at both state and federal levels. To better understand the mechanics of pensions, one must understand that people making the decisions in many cases are not experts at investment management. Trustees and board members of pension funds are encouraged to get additional training, when appointed, to better understand options but ultimately, they rely on information they have been provided. Wall Street knows this and has exploited pension fund investing over the years often joking about these funds being “dumb money” because recommendations were almost always accepted. High quality bonds and common stock make up most pensions. Bonds are typically viewed as a safe investment and provide some guarantees to the majority share of fund monies invested. The smaller common stock component of pensions is held to capture growth potential of the market but has more risk than bond investments. As Americans live longer, cost of living increases, and we experience corrections in the market (like in 2000 and 2008), pension funds are finding themselves unable to properly fund their obligations. 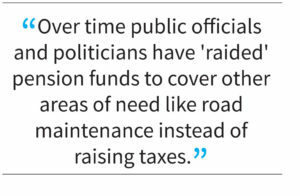 Over time public officials and politicians have “raided” pension funds to cover other areas of need like road maintenance instead of raising taxes. While raising taxes is an appropriate solution, it isn’t the best solution for those trying to win a popularity vote and take public office. Kentucky is the most extreme example, but they are not the only state facing these issues. Many experts say California is next on the list and nearly half of this country’s states are experiencing a pension shortfall. To correct deficits and not raise taxes dramatically, pensions managers have taken on riskier investments, such as hedge funds, in hopes of gambling their way out of the deficit. This strategy has made matters worse. Public pensions across the U.S. total roughly $3 trillion in assets. Part of this money is paid out to retirees while the majority is invested to meet future obligations. Hidden fees in plans and commissions paid to “placement agents” who secure pension fund money to invest has also contributed to the problem. Many pensions have been deemed unsustainable and those taking corrective action after years of neglect by their predecessors are feeling the pressure. To address a failing pension system that is unsustainable, pensions are offered less often. Retirement plan risk has been shifted back to employees with the implementation of 401ks and other contribution plans not guaranteed. This will ultimately affect the quality and number of people who consider these careers. To address these concerns, Gov. Gavin Newsom has a plan to improve the deficit, but this plan may not be enough. Do not wait to address these concerns. Planning now with tax advantaged vehicles can help ensure you and your loved ones have a comfortable future. 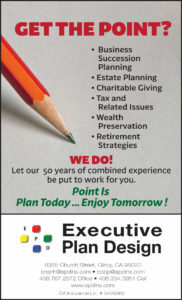 Brian Harrigan and Bob Price are the owners of Executive Plan Design. Contact them to learn more about safe options to solve the money “riddle” called retirement. For more information on strategies to maximize your planning and a free consultation, contact them at (408) 767-2572.